The AGITG Scientific Advisory Committee set the Group’s new research priorities in December 2018, defining areas of research that urgently need greater attention and have the potential to significantly improve the knowledge base for clinical decision-making and address vital unmet needs in GI cancer care. 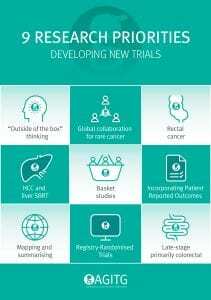 The current list reflects AGITG’s Research Strategy – to undertake a strategic, multidisciplinary, program-based, collaborative clinical trials portfolio to improve outcomes for patients with gastro-intestinal cancer. It focuses on pro-actively building the clinical trial portfolio, maximise recruitment and funding opportunities, foster multidisciplinary national and international collaborations, maintain and support a multidisciplinary membership base and maintain efficient and cost-effective structures and processes for optimal use of resources. Over time, AGITG’s Research Priorities will evolve with the cancer research landscape and will be periodically updated to reflect advancing science and unmet clinical needs.